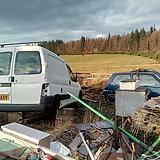 I've been offered any parts I need off this M59 Berlingo for free. I'd like to change the steering wheel on mine because it's disgusting, are the airbag systems/plugs different? Also it'd be cool to nick the electric windows out of the M59, one of my window mechanisms is buggered anyway, is the wiring there to accept electric windows? The fascia for the window switches won't fit of course.